Choosing a new hair and beauty salon can be as daunting as choosing a new hair style! 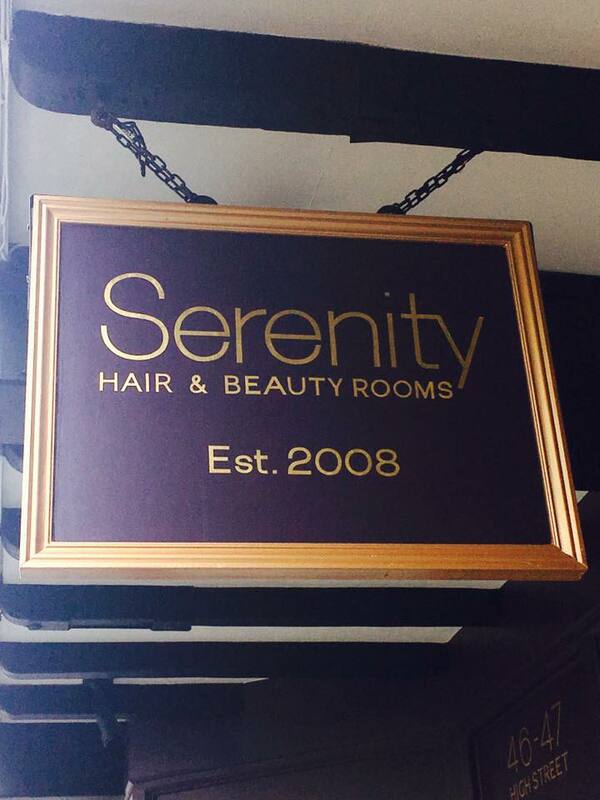 Here at Serenity in the heart of the Hastings Old Town we offer a warm and relaxed atmosphere with a professional team that are dedicated to ensure each and every client leaves fully satisfied and looking forward to their next visit, whether its they're first or hundredth. We are home to your entire hair and beauty needs. So whether you are treating yourself or a loved one you are sure to find the perfect treatment when you pay us a visit. We are all highly experienced and fully qualified stylists and beauty therapists who offer a professional, creative service and will listen and advise you either on a hair style, beauty treatment or a tanning session. Our team focuses on keeping customers looking good by knowing the latest trends, innovative treatments and experiences and using the best of our wide range of products. Our journey here at Serenity started when Julie Young (salon owner) decided to open her first salon business after being a hairdresser since the age of 16. Years down the line we have exceeded many of our salons ambitions by tripling our clientele, expanding our premises and winning ‘Salon of the Year’ three times throughout our years of business. Julie excels at making sure each and every member of her team shows professionalism to the highest of standards with excellent knowledge in their specialist area. Julie breathes a continued passion into thriving business with a loyal team and great customers. Very happy with my eyebrows shape. Amazing service. Very kind and professional staff. Thanks so much for your kind review. We look forward to seeing you next time. Always very good, friendly and professional. The hair wash was amazing! Thank you so much for your kind review Tricia, we are pleased you enjoy your experiences here with us at Serenity. We look forward to seeing you next time. Always makes me glad I live here. Very happy as always with the way Claire cuts my hair. Thank you for your kind review Rita. We are pleased you enjoy your experiences with us here at Serenity. We look forward to seeing you next time. I travel over 236 miles every four weeks to get my hair cut by Abbie. Well worth it. Thank you so much Tracey for your amazing loyalty, its always great to see you. thank you see you on your next appointment. Great cut colour and blow dry. Always feel great after the super pampering. Thank you Franca, its always our pleasure. see you again soon. Michael perfectly understood what I wanted with my haircut and the result is great! Highly recommended! Thank you so much for your review Benedetta, we are really pleased you enjoyed your experience here with us. Georgina was lovely and took such care over my manicure and pedicure. My nails look fabulous and it was such a treat. Thank you! Thank you so much for your review Emily. We are really pleased you enjoyed your experience here. Thank you so much for your kind review Maggie, it's always our pleasure. We look forward to seeing you next time. Always a great experience. Vicky really listens to what you want and never disappoints. Would highly recommend. Thank you so much for your kind review Emma. we look forward to seeing you next time. Fantastic hair colour today. As always Vicky has made me feel special. I’ve been coming to Serenity for a while and have Vicky do my hair and my family’s hair for over 10 years now. I wouldn’t go anywhere else. Thank you Janet for the lovely review! See you soon. Thank you so much for the great review Jo, we are so pleased you enjoyed your experience here with us. Apologies again for the wait, but we are pleased to hear it was worth it. We look forward to seeing you next time! Always happy to have appointment for regular haircut.Vicky listens and cares about my hair and always makes me good about myself.When your hair looks good one feels good.It makes my day and the weeks after. The other staff are also very pleasant and kind. Thank you so much for your review Eileen, we are really pleased you enjoy your experiences here with us at serenity. We look forward to seeing you next time. Thank you for the lovely review Jayne, we are pleased you enjoyed your experience here with us and look forward to seeing you on your next visit. The service was excellent. I was so pampered and spoilt. I wasn't expecting to have lots of little extras (hair wash, head massage, tea and biscuits, curling my hair) and Lia was so friendly. She knew exactly what I wanted after showing her a couple of pictures and she delivered. I am so happy with how she cut my hair. So much so that I will be leaving my current hairdresser to come here again. Thank you so much Holly for you lovely review! We look forward to seeing you again soon! Thank you for you nice review Jeremy. What fantastic ladies, Ive never felt so welcome and happy with a service, totally recommend. Vicky was so lovely; not only a great cut but she took time to really listen and check frequently that everything was ok. Really fantastic care and service from everyone. Thank you for your kind review Helen, we are really pleased you enjoyed your experience here. We look forward to seeing you next time. Thank you for the great review Mandy. +info helps us improve our salon. By letting us know what you didn't like, we can look into getting this right for your future visits.